Last year we announced that Sundance expenses were expected to increase by $27,500 annually, beginning in July, 2018. This is primarily from payment to our host club for rent and for a bar minimum set on Thursdays. 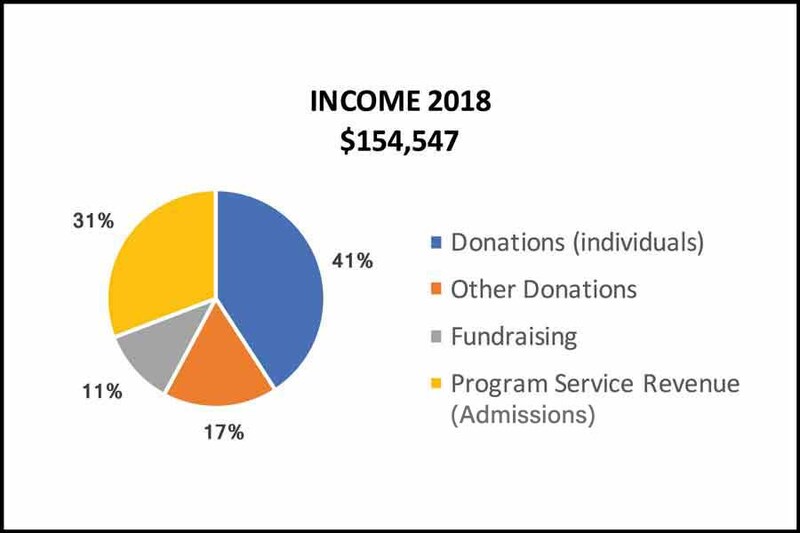 Our matching grant income increased by an unexpected $15,000, which exactly covered the amount we were planning to raise through our increased admission fee. Furthermore, Sundance received a $10,000 grant from the Horizons Foundation to apply to 2019. So we have deferred raising our admission fee, probably until at least January, 2020! The decline in admission income is not quite as bad as it looks. The planned increased entrance fee was to begin in 2019, so 2018 admission income should have stayed equal to 2017. However, we offered free admission the entire month of April, 2018, accounting for about $4000 of this loss. While we are currently in good shape financially, we must continue to work hard to stay that way. We expect our expenses to increase by another $10,000 annually beginning in July, 2019. Maintain membership income, remembering that it is natural that we will lose some members. See if we can put even more effort into the Dance-A-Thon. 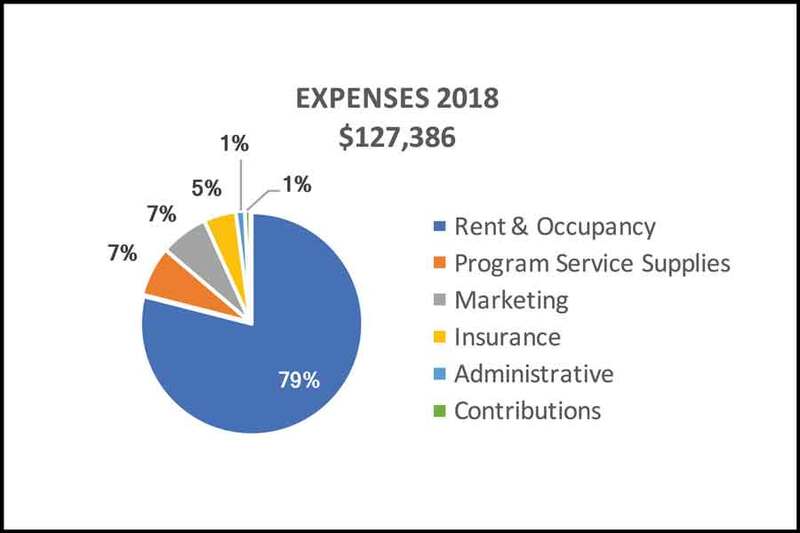 This chart shows 2018 expenses excluding the Sundance Stompede and Sundance Bandits projects, which are self-funding. Almost 80% of our expenses are for facilities rental. Administrative costs (excluding insurance) are around 1%. 58% of our income now derives from community support, including donations from individuals (memberships) and matching corporate grants. "Program Service Revenue" is the income from admissions. Attendance figures are written at the bottom. Excludes Stompede Thursday and Thanksgiving. We put the word out that beverage sales were important. And the response was very good. 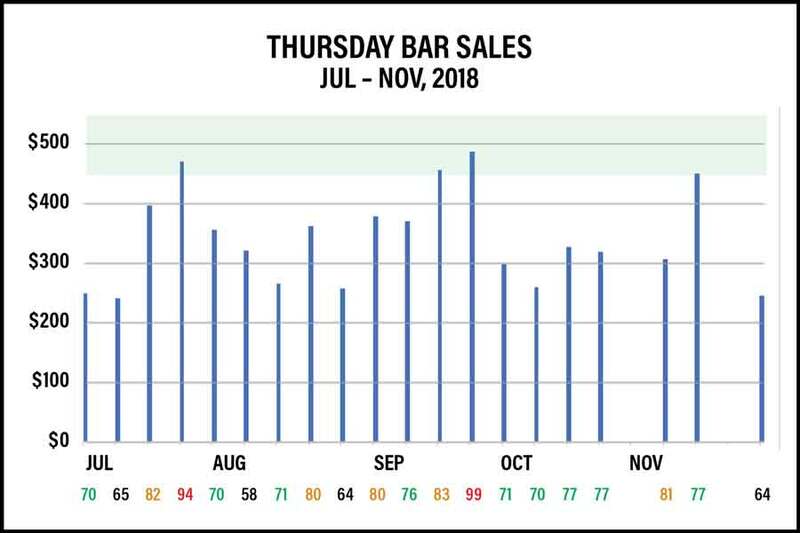 Our average bar sales increased to about $340. We actually exceeded $450 a few times. But some nights have continued quite slow, under $250. There is no consistency from week to week. We only have data through November. December was likely quite poor. It hasn't helped that the staffing of the bar is inconsistent. The problem: no club bartender wants to work for us on these very slow Thursday nights. So we are grateful for our current bartender, Sharif, for being there at all. But Sharif also manages the club, so he can be pulled in different directions, and he often leaves the bar for several minutes at a time. We are working on finding a solution, but for now we have to just ask for your patience and understanding. Sundance Saloon requires the help of its attendees to fill basic volunteer functions, such as the front door and coat-check. With fewer folks in attendance, we have to rely on a greater proportion of attendees to fill the same number of shifts. Somehow, our Sundancers always come through, but it can be quite stressful when there lots of shifts to fill. One month ago, the situation on Sundays looked pretty dire. On any given week, it’s no problem if we have 2 shifts to fill. We have a number of volunteers who are unable to schedule far in advance, but will take shifts from week to week. 3 empty shifts in a week is not bad, especially further into the future. But 4 is not great, and 5 is worrisome. A month ago, we had many, many weeks that were beyond worrisome, with 6 or more shifts needing to be filled. 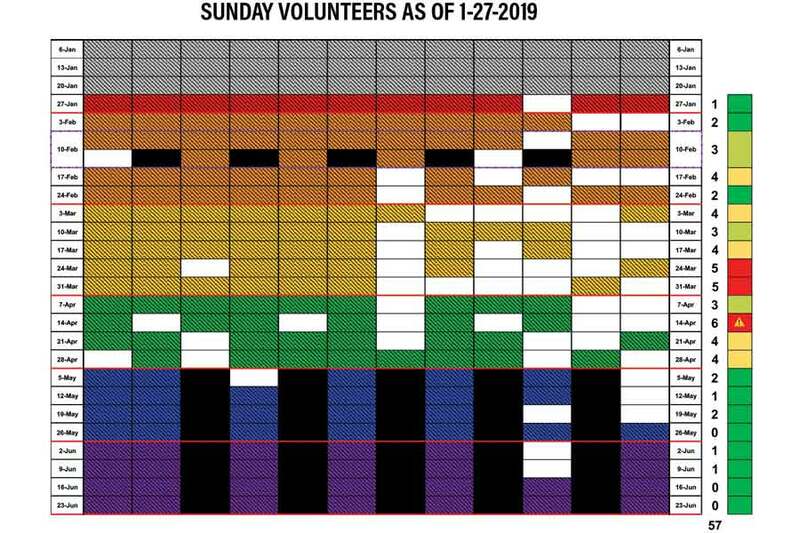 The key on the right side of the chart shows how dire the situation was for each week, with the number of empty shifts indicated. Somehow, just in the past month, the situation has turned around considerably. In December, we had 122 shifts to fill. We aren't looking to fill all of them in advance. Having 50 empty shifts would be an excellent goal. That would give us about 2 empty shifts per week. 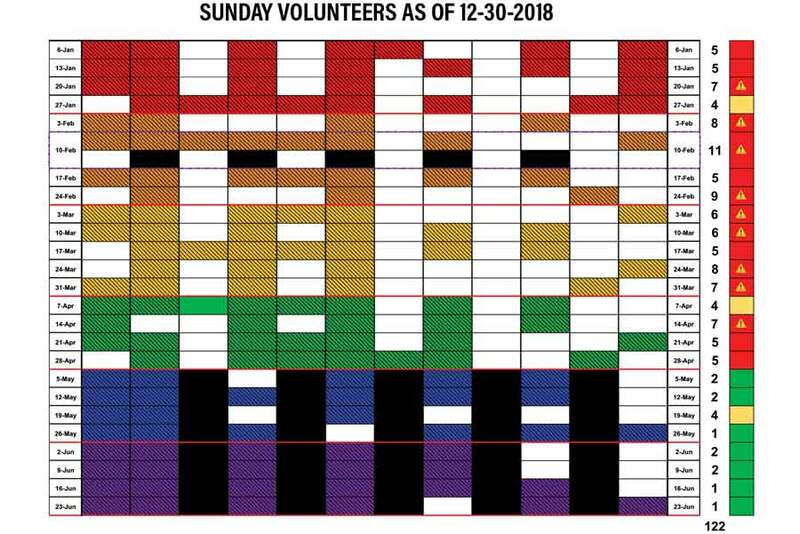 By the second week of January, this was down to 101 shifts to fill. It's now down to 57. A suggestion was made to combine the coat-check and front door on Sundays, even in the winter. While there are advantages to doing this, there are also disadvantages. Since we are doing so much better with volunteers, there is probably no need to explore this option now. We will continue to solicit new volunteers and emphasize the importance of everyone helping out. In 2014, Sunday admissions averaged above 200, and Thursday admissions above 100. Admissions have been on a decline since then. In 2017 admissions fell to about 150 on Sundays and 75 on Thursdays. Our goal was to reverse this trend. 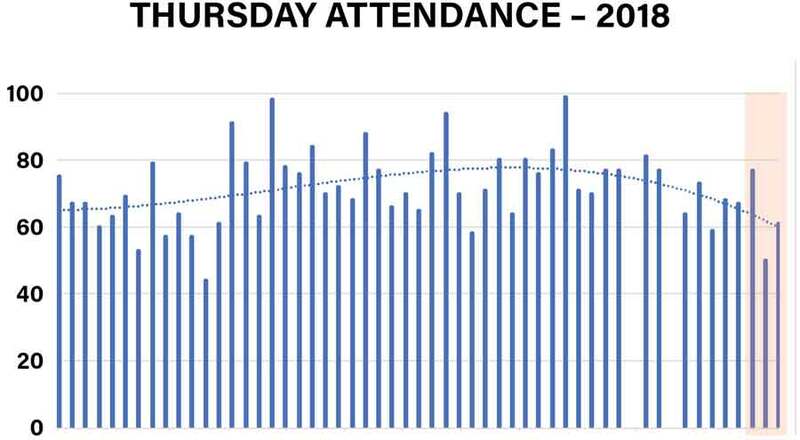 In the first part of the year, Thursday attendance fell to a dismal average of 60 per night. We started putting more energy into increasing admissions, through paid advertising on Facebook, and inviting groups to come to Sundance Saloon. 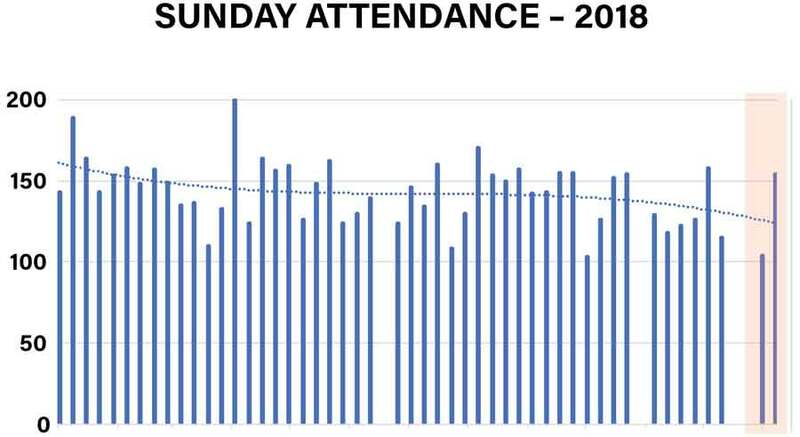 Thursdays showed some improvement in the summer, with average attendance approaching 80 at one point. Unfortunately, this has fallen off again, and in the past couple of months we've been back into the 60s. January through December, 2018. The shaded area to the right is January, 2019. Stompede Thursday and Thanksgiving excluded. Sundays were holding steady at an average of about 140 through much of the year, but in the past couple of months we're down to an average of 125. Traditionally we get a surge in January each year, but this has not materialized this year, at least not yet. January through December, 2018. The shaded area to the right is January, 2019. SF Pride and Stompede Sunday excluded. Increasing admissions has become an urgent problem, and it is also the key to every other concern we're facing. With increased admissions, our finances, bar sales, and volunteer concerns would all automatically be reduced. But how to increase admissions? This is a mystery, and so we'll be trying multiple approaches, and even then, it will be nearly impossible to know which approach works. Encourage attendance. Especially for our regulars, understand that just by attending, you are supporting Sundance. Invite friends who have lapsed to come back! Word-of-mouth. This has always been the primary way new folks are introduced to Sundance Saloon. Bring your non-dancing friends! Typical excuses of "I don't like country music" or "I can't dance" aren't really valid. Many of us didn't think we liked country music before we started dancing to it, and pretty much none of us could dance when we started. Social media. We will be increasing our budget significantly for paid social media advertising. But there are lots of ways to get Sundance publicity for free. Every post and every mention of Sundance Saloon on social media is de facto advertising! At some point we hope to hit on something that sparks a small viral interest. When you see a Sundance post, "Like" it, or even better, "Share" it. When you see a Sundance event, "Invite" your friends. Post something yourself from or about Sundance Saloon on any social media platform. Post reviews on Yelp, Google, and Tripadvisor. Group invitations. We have had some good response inviting various groups to Sundance Saloon. We've posted information about inviting groups below. If your company has an LGBT group, invite them to a night out at Sundance Saloon. Check out Meetup.com for potential groups to invite. Consider nonprofit groups to invite. Celebrate personal events such as birthdays and anniversaries. Free or low-cost listings. There are lots of sites with free listings, but we have not kept up with these. We need to do research to identify potential on-line free listings, and then get our listing added (or in some cases corrected). Who wants to take this on as a project? Encouraging newcomers to return. We're always happy to see new folks coming to Sundance, but many come once, have a good time, and then don't return. Part of the problem may be that, as friendly and welcoming as we are, Sundance Saloon can be quite intimidating for novices. Make an effort to dance with new folks. Keep your dancing basic and uncomplicated. Offer to help them count! Emphasize to new folks that it takes patience and repeat visits to get comfortable. Encourage folks to return – "I hope to see you next week!" What other ideas do you have? Send them to info@sundancesaloon.org! Inviting groups to an outing at Sundance Saloon is great new way we've discovered to get new folks in the door. We have had luck with offers to corporate LGBT groups (e.g. Apple night at Sundance), nonprofit organizations (e.g. Gay Men's Chorus, Cheer SF), and various Meetup.com groups. This is a nice opportunity for groups to socialize and build rapport outside of their usual environment. Private groups to celebrate birthdays and the like are also great! See if anyone else has already invited the group. If not, feel free to enter your prospective group name and your name. Check the calendar for possible dates. We'd prefer not to have multiple large groups on one night. We also advise avoiding special event nights. But none of this is absolute. Check out the sample invitation for details about what groups can expect. This invitation was written specifically for Meetup.com groups, but other groups can still used this invitation as a starting point. For nonprofit groups, we will offer free admission to the group, if they come on a Thursday. If you arrange a date for your group, enter it into the spreadsheet calendar. Please also contact info@sundancesaloon.org to confirm. Meetup.com is a web portal that allows people to organize meet-ups over the internet. Some of the groups are based purely around having people meet and mingle, while others are centered around hobbies, careers, or business networking. We have found many groups are compatible with holding a meet-up at Sundance Saloon. We'd like to enlist your help in seeking out these groups and inviting them to Sundance. You don't have to join the group, but it might help. Joining is free, and there is no obligation once you join to attend any of the group's events. In fact, most members of a group seem to be inactive. Do a search for Groups. An example might be "LGBT" within "10 miles" of "San Francisco." If you find a likely prospect, check to see if anyone else has already contacted the group. We are keeping track of things in this Google Docs spreadsheet. Fill in your prospective group and your name if you take on a group. Send an invitation to the organizer. You may not have to actually join a group to contact the organizer, but it’s probably helpful. Some groups will require that you join. Check out our sample invitation you can use as a starting point. The group will need to understand that they are attending an event open to the general public. While there will be plenty of opportunity to socialize and mix with each other (especially during the reception and lessons), open dance time will also be an opportunity to socialize and mix with everyone at the club. If your group decides on a date, enter it into the spreadsheet calendar. If they pick an inappropriate date, you may want to negotiate a better date with them, but we can make just about any date work. I recently joined this group and am interested in suggesting an activity. I’m a regular at Sundance Saloon, SF’s LGBT+ country western dance club, and I thought it might make a fun outing for the group. No partner is necessary, and they give beginning dance lessons every time they’re open, which is Thursday and Sunday nights. Admission is $5. They’re in a club with a full bar. There’s a big dance floor and lots of space to hang out away from the floor. Unlike most club events, it’s a very friendly atmosphere with an incredibly diverse crowd of men and women with ages ranging from 20s to 70s. The group will mix with the larger general attendance crowd, but we will provide name tags for group members to identify each other. The reception time will likely be mostly with the group. Let me know if this is of interest, and I’m happy to play any part in organizing. Possible additional lessons 8:00 – 8:30 for the group. Sundance is a not-for-profit organization and is run by volunteers. It rents space from 550 Barneveld, San Francisco.